Like Jesus, a series at Riverview, November 2009. We set up six sheets of paper (from a 150ft roll) slightly distanced from the back wall. 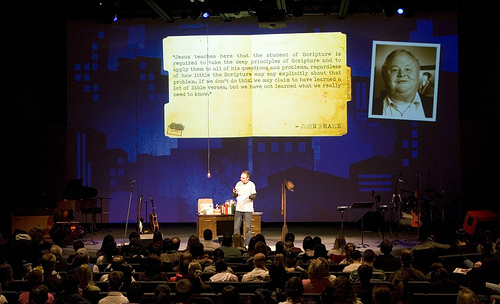 The background projection was masked in Keynote to only display on the paper, with video running during the music sets. 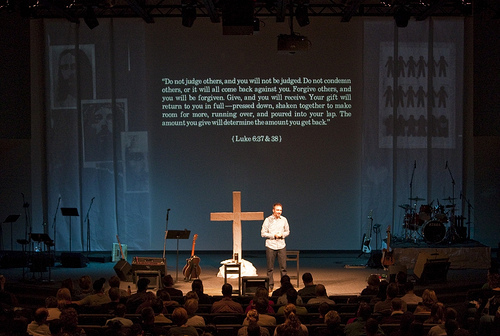 The cross center stage is a plywood structure wrapped in the same paper we used on the back wall. 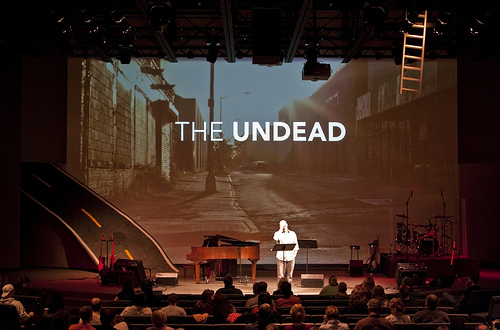 The Undead, a four week series at Riverview, October 2009. After ripping out our “The Napkin Manifesto” set we started work on the road and ladder visible here. The ladder is 2x4s cut to size, screwed together and painted, it is screwed to a 2×6 painted black with safeties to the architectural truss. The road was significantly more complicated. Because it has a slope and curve to it and becomes narrower at the top, the structural supports were improvised. It is held in place using mostly steel studs/rail and the top is 1/8in lauan. We put on a few coats of different paint with a texture roller and hand painted the lines. 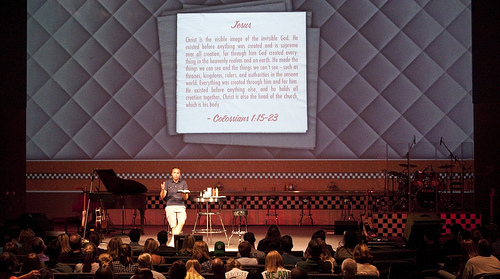 “The Napkin Manifesto” series at Riverview. We ripped out the wall that had been up for the last few series’ sets and quickly proceeded to build a 30ft diner-style counter. The front of the counter is made from 4x8ft sheets of tile board (looks kind of like tile and has texture but it’s definitely not real tile) cut down in three sections. 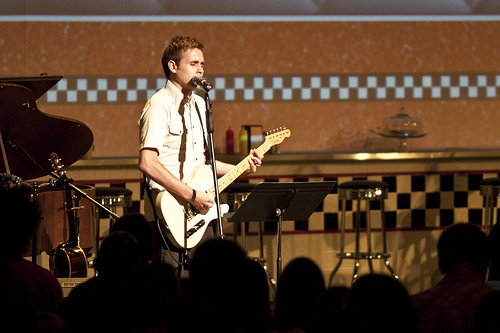 The the drum riser and the middle section of tile board on the counter was hand-painted in a checker pattern. The counter-top (painted plywood) has a strip of floor threshold attached to the front of it so it looks legit. We had a bunch of stools shipped in and assembled them, and a generous friend lent us their diner-style cocktail table for the duration of the series. At the end of the series we’ll be selling the stools locally since they are too expensive to keep in the budget. 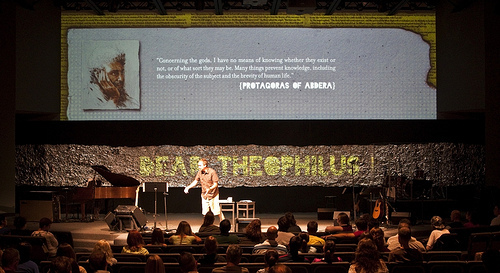 “Dear Theophilus” series at Riverview. Probably one of our fastest set installations ever, we painted our false wall black and covered the middle section with aluminum foil. Unfortunately, the spray adhesive we used to put up the aluminum foil failed after about a day and we had to come back and staple it all back up. Message resources are available here. We started by pulling the CRAVE series pegboard off the (horizontal) middle section of the false wall. We had built 14 stand/shelf units to set monitors on and ran all the wiring for the displays. 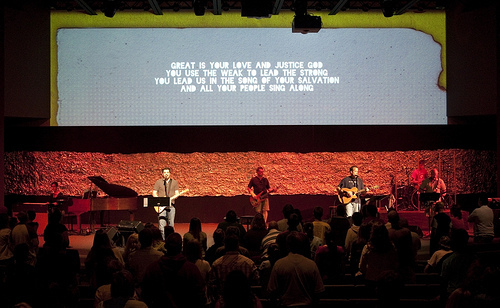 Once the monitors were installed we put up sheets of hardboard (same material as the rest of the wall) and used a recessed lighting cut-out bit to create holes of varied sizes where the monitors are and painted the whole thing gray. 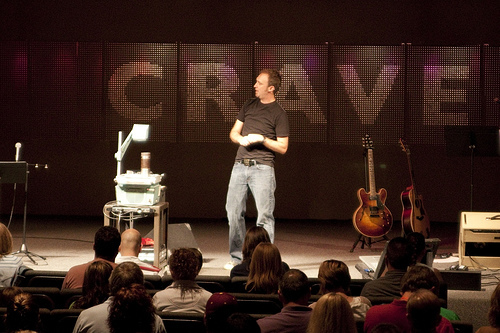 The three week CRAVE series at Riv. We pulled down the black fabric from our previous set build and replaced it with eighth inch hardboard and pegboard. The pegboard has 1 mil translucent plastic behind it and we drilled out holes so the backlights would make the letters CRAVE visible. All the LED lights that were pointed up were reoriented to point down and toward the back wall so that the holes in the pegboard would effectively glow with color. The most involved part of this was attaching all the sheets of hardboard and pegboard. We went through almost two full boxes of screws. Given the option I would have used 3/16 inch thick materials but that would’ve cost nearly twice as much, which is crazy. 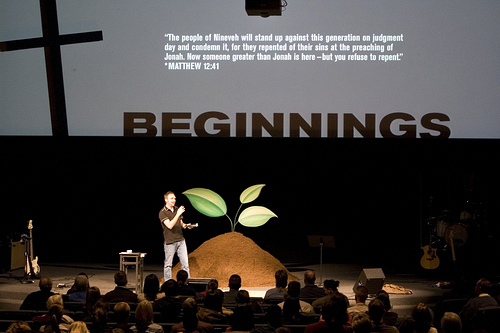 Beginnings was a five week series at Riverview on the Old Testament, culminating with Easter services highlighting prophesies that point directly at Jesus. The original design called for many trees/roots, then we talked about sunflowers, then a single tree, then saw Andrew Hunt’s Blue Ridge Origin set and decided we should ask to use the idea. So, over the course of almost a week we constructed this set. There is a steel stud wall across the full length of the back wall (about 54 feet) with 3mil plastic and polymuslin cloth covering it. 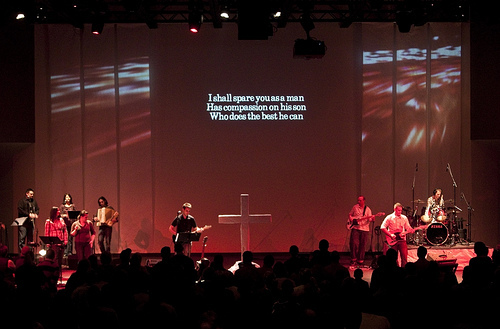 Attached to the back of the wall are 25 LED lights and the cross (also made from steel studs covered with plastic and material) is attached at the architectural truss and to the back of the wall. 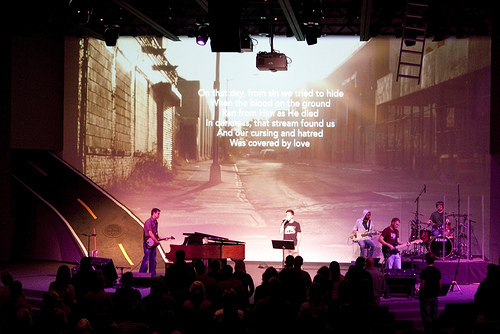 The gray area and lettering is all projected on our white wall. The ‘dirt pile’ is actually a structure of wood and chicken-wire with landscaping fabric covering it and 10 cubic feet of peat moss spread over the structure. The leaves are 1.5in Styrofoam that was cut with a jig-saw, painted and then holes were drilled in the ends to put bent PVC pipe into. The PVC was bent then spray-painted. It may not sound like all that much but it was a long build. 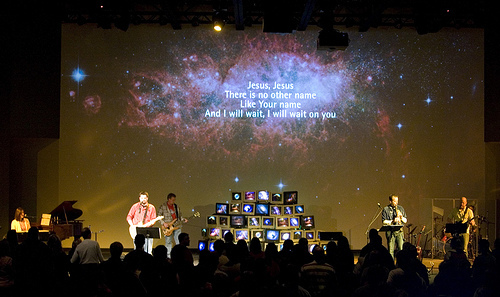 Riverview series on a few of the names of God. 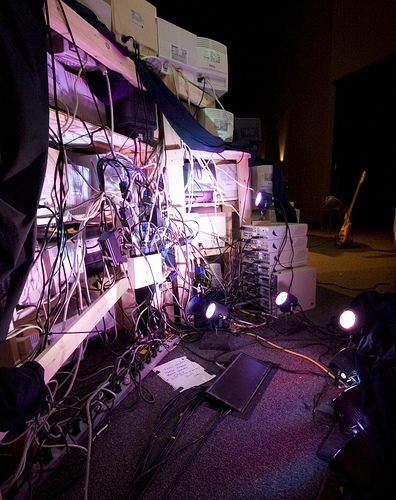 Forty CRT monitors attached to nineteen splitters, attached to seven old computers. Each computer is running the same 7 minute video on a delay of 45 seconds or so. 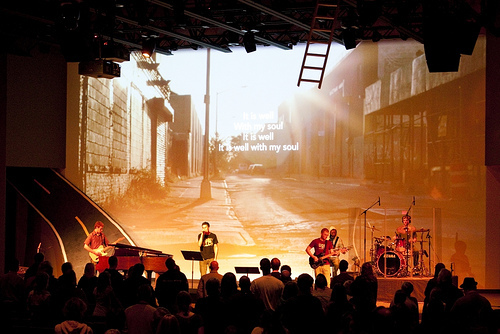 The back wall projection is a static image that changes for each service segment and each song. 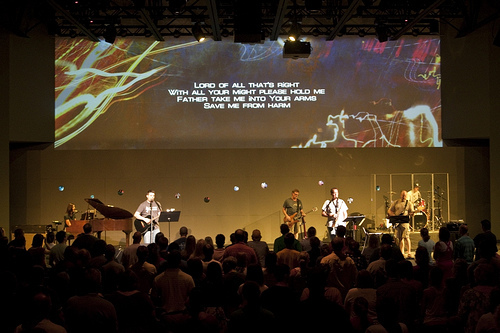 The lighting during the music is setup on a 30 second fade from color to color. There are a handful of little Chauvet LED lights behind the monitor structure. The monitor stand was built level by level as we added each row of monitors. Riverview’s “Declassified” series which ran in January. 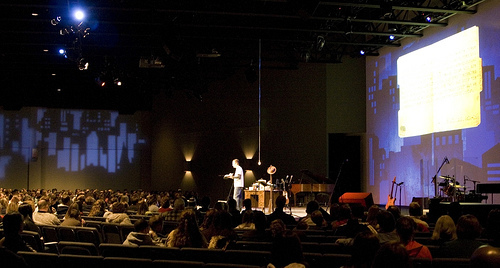 Loosely based film noir look, cityscape gobos on lights pointed at the side and back walls of the auditorium, projected cityscape on the stage wall. One fixture with a G40 incandescent bulb hung from the architectural truss. 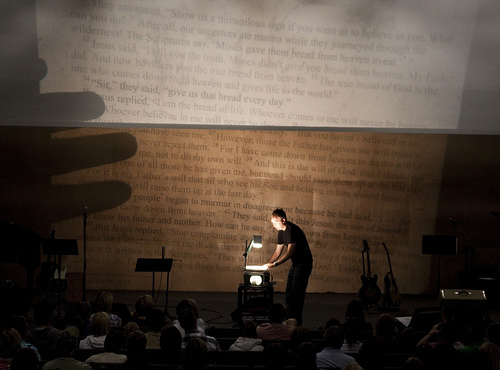 A desk/typewriter/wire-fan/coat placed on the stage. 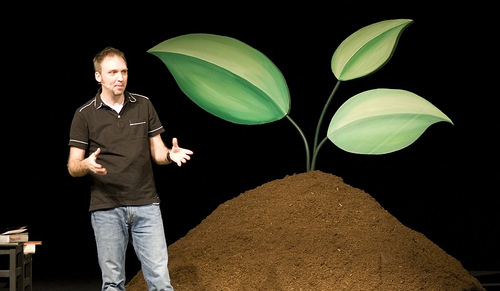 Six upside-down inflatable globes hung from the auditorium ceiling using floral wire to accompany projection of an upside-down map of the earth on the back wall. We had to reinflate a couple of the globes every week because they became droopy.